said to be the most haunted ship in North America. All sorts of spooky things have happened over the length of the 1,019-foot, 81,237-ton liner. 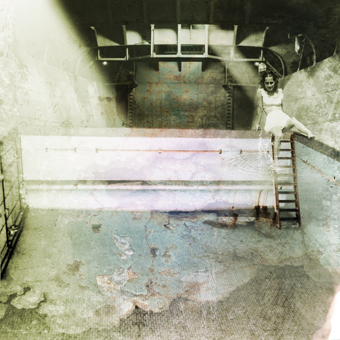 Lights flicker, and doors slam unaided by human hands on the “G” deck, thought to be the location of the ship’s morgue. Another hot spot is the swimming pool, where the ghost of a middle-aged woman in an archaic swimsuit sometimes dives into the empty basin. She’s believed to be the spirit of a woman who drowned there. Some people have seen a young, mini-skirted woman pace around the pool area and disappear behind a pillar. Sounds of shouting and splashing have been heard at the deserted poolside deck as well, and there are also stories of ghostly, watery footprints appearing along the pool’s edge. More unnerving phenomena have been reported in one of the kitchens. During World War II, when the ship was used as a troop transport, a brawl erupted in the galley, and a cook was shoved into an oven and burned to death. Now, near the site of his death, light switches turn themselves on and off, dishes move under their own power, and utensils mysteriously vanish. Other shipboard phantoms include an elegantly dressed “woman in white” who hangs around the salon’s piano, a ghostly officer who walks near the bridge, and a black-bearded man in coveralls who rides the engine-room escalator. The latter is thought to be the spirit of John Pedder, an 18-year-old seaman who was crushed to death by a watertight-door during a routine drill on July 10, 1966. For some reason, the engine-room area is the most haunted place on the ship. Staff members and tour guides who go there report clanging and knocking sounds, chains being whipped and dangled by unseen hands, and balls of light moving slowly across the walls. Tom Hennessy, a Long Beach Press-Telegram columnist who was initially skeptical about ghosts on the Queen Mary, spent a night near the ship’s engine room and came out a believer. During his stay, he was menaced by moving oil drums, felt the vibrations of some invisible presence walking towards him on a catwalk, and heard clanging noises that stopped when he approached them. Hennessy’s eeriest experience came at 3:33 AM, when he heard two or three men talking in the deserted propeller-shaft room. He distinctly made out the words, “…turning the lights off,” from one of them. A security guard who had monitored the area later told him that no living people had been near the shaft room when he heard the conversation, and said that other people had heard ghostly voices there as well. Over the years, the Queen Mary’s reputation as a ghost ship has grown, and it has become one of California’s most famous haunted sites. Numerous newspaper and magazine articles and TV shows have featured stories about the liner’s many unexplained phenomena, and reports of weird happenings aboard the ship continue to filter in from tourists, employees and the occasional ghost-hunter. Her days as a seagoing luxury liner may be long gone, but the Queen Mary has found a new life both as a major tourist destination, and a floating home of ghosts. 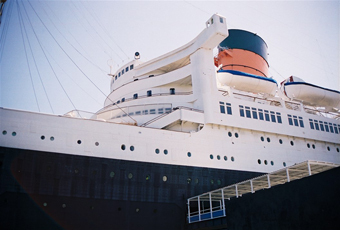 This spring my daughter and then the entire family (my son, daughter and myself) visited the Queen Mary in Long Beach, California in May of 2004. During the visits we got much more than we ever planned on. Some of it we even got on film. A little background first––The RMS Queen Mary was a passenger liner built in the heyday of trans-Atlantic passenger cruise services. She was a troop ship during WW2 and was retired from in 1969 when air travel had effectively replaced passenger ships. The QM was brought to Long Beach and became a permanent dockside attraction. In the ship's long and illustrious service, there were many happy and tragic moments associated with the great ship. Some individuals seem to be reliving these moments many years after they have passed from the ship and their mortal coil. My daughter and her Girl Scout troop actually visited the ship last month (April) and she encouraged me to bring her back. Part of what encouraged me was several pictures that she took which couldn't be explained. One of them had a glowing ball of light that there was no possible explanation for and another contained a picture of a little girl leaning in on a conversation among the Scouts. What amiss about that? None of the Scout Troop remembers ever seeing another girl there, not to mention there's no place for her to be standing. When we visited the ship and my daughter insisted that we take the Ghost Tour to see the more interesting parts of the ship. When the tour reached the First Class Pool, something truly interesting happened. My daughter and I had the sense that we weren't alone, and I don't mean the tour staff or fellow tourists. At various areas I felt strongly compelled to take photos to document what I was feeling. This culminated in when the guide took my kids and I back to the changing stalls behind the pool. I wrote up a brief description in haste and left it with the tour office on the Promenade but it doesn't give the feel of what happened, nor do I believe will this. When I entered the stalls area, I immediately felt something wasn't right and that we aren't completely alone. I could feel and hear movement closely and at the end of the hallway when there wasn't any. There was also a slight fragrance that at the time I discounted, but didn't match with anyone else on the tour. As I started to depart, I thought I saw movement at the end of the hall so after presenting and holding my 35mm camera to my chest, I attempted to take a picture without giving away that I was taking the shot. I was using a Minolta Maxim 3xi, with an IR range finder for auto focus function, and using 400speed, hi definition film. Normally this is a very quick camera to find its target, and set itself. It took the camera about 2 seconds to find its range as it focused in and out several times to find a target. I got much more than I bargained for. But that is the end of this story rather than what happened next. As I turned to leave the stalls, I sent my children ahead of me. Turning the corner to go into the main pool area, I felt two distinctly female hands slide up along the sides of my waist and felt the thumbs of each hand press lightly but firmly into my kidneys. I was then physically pulled backward about 6" to 1 foot. The pull was strong enough that I threw both arms out to the sides to catch the frame of the entranceway. What's odd about this? The nearest living person to me other than my children was our male guide, who was over 5 feet away from me. There was no-one there. Additionally the "hands" slid through rather than under the camera case that was hanging on my right side over the waist and hip. The camera case was never moved aside or jiggled by the “hands.” My daughter later told me she turned and see me being pulled backwards.